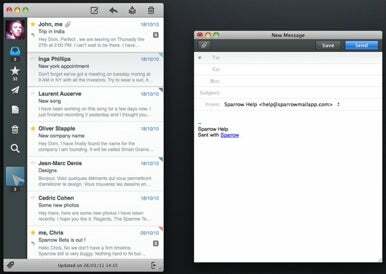 Sparrow, the Gmail client that debuted in February with a streamlined approach to working with e-mail, has received its first major update. The new version moves beyond Gmail with support for MobileMe, Yahoo, and other providers, as well as a number of other much-requested features. At the top of Sparrow 1.1’s list is IMAP support, which means users of MobileMe, AOL, Yahoo, and many other e-mail services can now give it a try (and to that effect, the free Sparrow Lite version should help, though it hasn’t received the update treatment yet). Sparrow 1.1 also brings support for custom features offered by some services: for example, you can create multiple outbound aliases for each e-mail account—one of MobileMe’s advantages that dates back to its .Mac days—and Sparrow’s Archive option required no configuration to use MobileMe’s new archive folder. Sparrow’s other new perks include support for Gmail’s Priority Inbox, a recent addition that can intelligently sift through your inbox and show you the most important e-mails first, regardless of when they arrived. Sparrow also now boasts per-alias signatures, a formatting bar for drafting messages with rich text, multitouch gestures, contact groups, and Gravatars for automatically displaying photos for message contacts. Finally, a new minimal option can hide the preview from the message list, allowing you to pack more messages into the same window space. And, of course, nearly two dozen bugs lost their lives to bring us Sparrow’s update. Sparrow 1.1 is available now in the Mac App Store for free to current owners, and just $10 for everyone else. It requires Mac OS X 10.6 or later.